Light waves can behave like particles (photons) and waves. This phenomena is called the wave-particle nature of light or wave-particle duality. In this article, how a light wave behaves like a particle and a wave are explained. 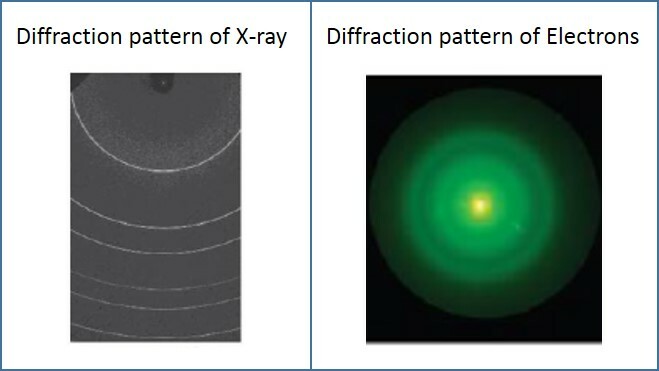 When a beam of X-rays of a single wavelength is directed at a thin metal foil, a diffraction pattern is produced, as illustrated in Figure 1. This phenomenon is similar to the diffraction pattern produced when light passes through a diffraction grating. The foil contains many tiny crystals. The gaps between neigbouring planes of the atoms in the crystals act as slits, creating a diffraction pattern. Electrons are considered to be particles. When a beam of electrons is directed at a graphite film, a similar diffraction pattern is produced, as shown in Figure 1. According to Albert Einstein’s theory of quantised energy, light energy consists of a stream of energy packets called photos. A photon is defined as a quantum of energy when the energy is in the form of electromagnetic radiation. Photoelectric emission is defined as the release of electrons from the surface of a metal when electromagnetic radiation is incident on its surface. The electrons that are released in the photoelectric emission are called photoelectrons. 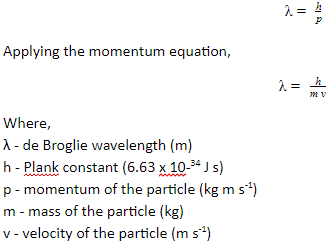 This shows the particle nature of light. Light waves can behave like particles (photons) and waves. This phenomena is called the wave-particle nature of light or wave-particle duality. A diffraction pattern is produced when a beam of X-rays of a single wavelength is directed at a thin metal foil. Electrons are considered to be particles. When a beam of electrons is directed at a graphite film, a diffraction pattern is produced. Photoelectric emission shows that light can behave like a particle.